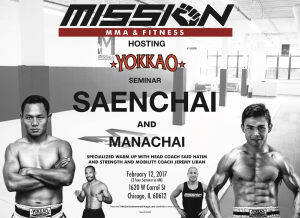 2017 Yokkao Seminar at Mission MMA and Fitness - Saenchai and Manachai! We are excited and honored to announce that Mission MMA will be hosting a Yokkao Seminar featuring Saenchai and Manachai on February 12, 2017! Saenchai (known as the Living Legend of Muay Thai) is considered the best pound-for-pound Muay Thai fighter in history with 299 Wins in 354 Fights. Manachai is currently ranked the #1 Lumpinee fighter in his weight division with 180 Wins in 270 Fights. This event will take place the morning of the 12th for approximately 2 1/2 hours - time TBD. The seminar will consist of Muay Thai technique focusing on Saenchai's signature style along with some sparring/clinching technique. There will be a warm up before the seminar taught by Strength and Mobility Coach, Jeremy Liban, and Head Coach, Said Hatim. You will have the option for autographs as well as a certificate of attendance signed by the fighters. Mission MMA is the only location within the city hosting this amazing Yokkao seminar. The seminar will be capped so spaces will be limited. Please e-mail immediately to reserve your spot. **Please contact Mission MMA and Fitness directly at info@missionmmachicago.com to get registered or if you have any other inquiries.